Rediff.com » Business » Once penniless in Mumbai, now a crorepati! Once penniless in Mumbai, now a crorepati! Hunger was his only companion when he roamed the streets of Mumbai in search of a job. 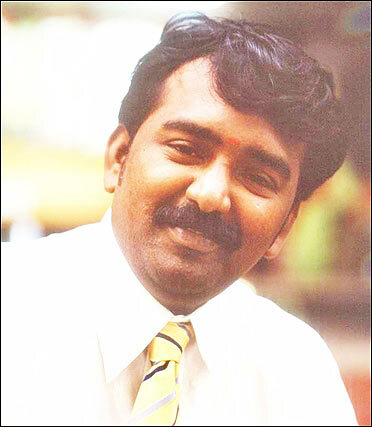 At age 17, Prem Ganapathy left his native place Nagalapuram in Tuticorin without informing his parents in the pursuit of making money, after a person promised him a job in Mumbai. Destiny, however, willed otherwise. There was no job as the man promised. Instead he was abandoned in Bandra, a Mumbai suburb. But this boy did not lose hope, he decided to stay back and fight for survival. Ganapathy turned his misfortune into the biggest opportunity of his life. He found a job as a dishwasher in one of the bakeries in suburban Mahim. He worked for about two years across restaurants in Mumbai doing all sorts of odd jobs. He soon realised that there was a good potential in the catering business . . .
Click NEXT to read more about Ganapathy's amazing success story . . . 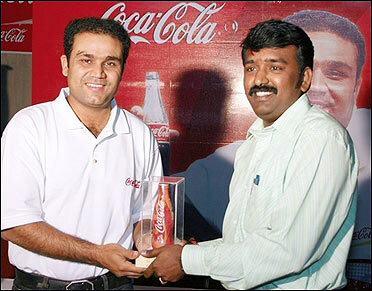 Image: Prem Ganapathy receives a memento from star cricketer Virender Sehwag during the Mumbai Festival. Finally, in 1992 he took a handcart on rent to sell idli, dosa and vada. His brothers also joined to help him. His items became very popular as they had a different flavour and variety. He even got the homemade sambar masala from his native place. Ganapathy's hand cart did brisk business. Five years later Ganapathy was confident enough to open the first Prem Sagar Dosa Plaza outlet outside Vashi station in Navi Mumbai. Since then there has been no looking back . . .
"My father instilled in me a lot of positive energy. This is what kept me going strong. I have tried to see an opportunity in every loss. Even when people teased him, saying 'your son has ditched you and gone far away', he always used to tell them 'I am happy for him as I know wherever he is, he will do well'. If I had not come to Mumbai, I would have never been so successful," he says. Click NEXT to read how Ganapathy landed in Mumbai and made it big . . .
After Ganapathy completed his tenth standard, he did not want to study further. "My teacher told me that I should continue studying but I told her frankly that I do not want to study. We had lot of financial problems so I wanted to work and earn money, help my family. Even getting water and firewood was an arduous task. We had to walk miles to get water and firewood," says Ganapathy. His father had a tobacco business which ended in a loss. He also incurred huge losses in the farm. With seven children, his parents struggled to make ends meet. He decided that he would get them a good life. "Many young boys from our village were working in coffee shops in Chennai. So I also decided to join one of those shops. I worked there for about two years for monthly salary of Rs 250," he says. Those days his only ambition was to make money and open a coffee powder shop. However, he was destined to take a different path. 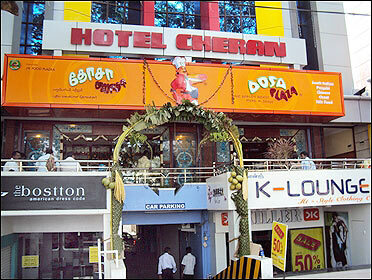 Image: Dosa Plaza outlet in Coimbatore. In Chennai, he met a young boy who promised him a good job in Mumbai. "He said if I pay him Rs 200, I would get job with a salary of Rs 1,200. I wanted to leave but knew my parents would not let me go. I was only 17 years old then. So I left Chennai without informing my parents," says Ganapathy. They got down at Mumbai's Chhatrapati Shivaji Terminus, a place where thousands of migrants land every day in search of a better livelihood. "I was scared but I was willing to take the risk. We took a local train to Bandra and I was eagerly waiting to see where I would begin my new career. He took me to a tea shop and vanished. My worst fears came true. He had just dumped me there," Ganapathy reminisces. 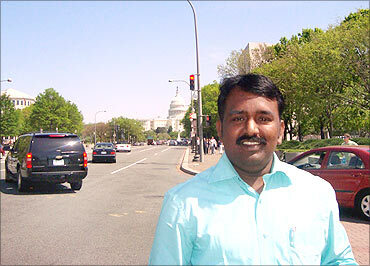 Image: Ganapathy during a trip to the US. It was the most unforgettable day in his life. He could not speak Hindi, he did not know anyone in the city nor did he have any money. Finally, he met a friendly taxi driver and told him his story. "He took pity on me and said they can collect some money and send him home. The train fare was Rs 121 then. But I said I will not go back home. I will do some work and live here. I slept in the temple compound till I found a job in a bakery in Mahim to clean pizza-baking vessels. I used to sleep in the shop itself," he says. After working there for six months, he found another job, to deliver pizza bread to a hotel in Chembur. Later, he moved to Navi Mumbai where he started working as a dishwasher in a restaurant called Gurudev. "As a Tamilian, I faced discrimination in the beginning. We were given only kitchen work to do. After a while, I started to move out of the hotel, to give tea/coffee to shopkeepers around that area. I used to earn Rs 1,000, three times more than the other boys as this service was based on a commission basis," he says. Ganapathy was meticulous and sincere in his work. Unlike others, he never got into squabbles with anyone. "I used to keep a note of every person's requirement, some wanted strong tea, some wanted it without sugar. So I established a good rapport with the outside world. One person who had a small business saw that I was enterprising and hard working so he suggested that we open a food stall on the street on a joint partnership. He invested the money and told me to do the work and he promised me half of the profit," he says. The stall near the market area did good business. But the person duped him. He refused to give Ganapathy any share of the profit as promised and said he would give only Rs 1,200 as salary. So he called off the partnership and decided that it is best to do something on his own. Image: Dosa Plaza, an instant hit. Ganapathy realised that starting a food stall would be the best way to earn good money. Two years after he landed in Mumbai, in 1992, he went back home, got his brothers to help him. "I borrowed some money from friends and rented a handcart for Rs 150. It was really difficult in the initial days. Many times, the municipality vans used to come and pick our handcart. But I was very positive and determined. I never gave up hope," says Ganapathy. "I scored on account of cleanliness and the variety of food I offered. I got the recipes from my mother and brought the masala from my village. . . so the food I offered had a distinct flavour, which made it an instant hit. 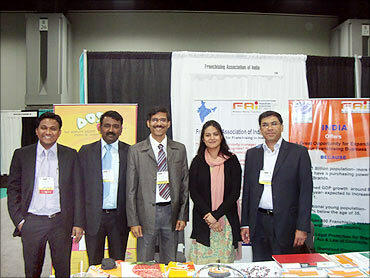 Image: Ganapathy at a franchise meet in Dubai. Ganapathy was lucky to have helpful roommates. They were very friendly and supportive. "Since they studied at NIIT, they guided me well. They even taught me a computer course. They also spread the word around about my dosas. My business did well," he says. Ganapathy's day used to begin at 5.30 a.m. everyday. He cooked the food all by himself, used to be on the road till about 3.30 pm. "I took a break of two hours every evening and spent the time surfing at a cyber cafe. I used to read about various businesses and learned quite a lot. My brothers also played a crucial role in making the business a success," he says. Image: Dosa plaza in Bhillai. Five years later, when Ganapathy had a regular clientele he became more confident about the business's future prospects. Interestingly, McDonald's opened its first restaurant in Vashi near his stall. "I was amazed to see the long queues of people who wanted to buy a burger. What is so great about the burger, I used to think. That's when I realised how a restaurant can make a big impact." "I did a lot of reading and talked to several people who had similar business. Then I started to look around for a suitable place where I could set up a food outlet and get a good customers," he explains. Finally, in 1998, Ganapathy decided to take a kiosk outside the Vashi railway station in Navi Mumbai to open the first outlet called Prem Sagar Dosa Plaza. Fortunately he got good response from the first day itself. "I added more variety to the menu. Along with his dosa outlet, I also tried my luck by investing in a Chinese restaurant, but it flopped. 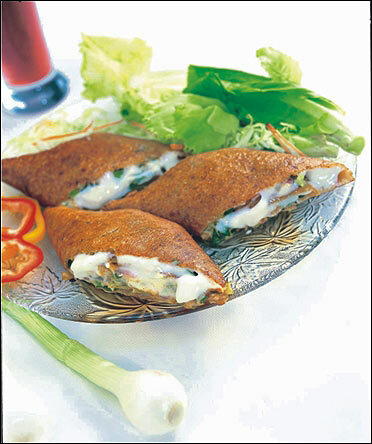 However, I tried to add the Chinese flavour in the dosas, which worked very well," he says. His experiments with dosas resulted in exotic varieties like American Chopsuey, Schezwan Dosa, Paneer chilly, Spring roll dosa to name a few. 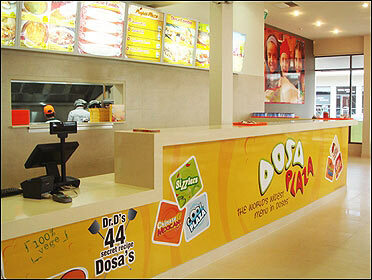 Within a year, Dosa Plaza had created 25 original varieties of dosas. "I did a lot of experiments to improve the taste and variety. 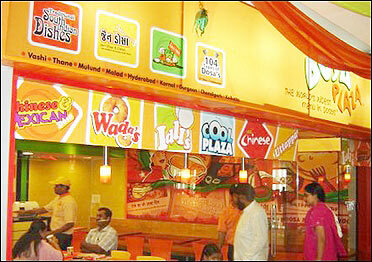 By 2002, Dosa Plaza had 104 delicious varieties of dosas." "In 2003, a new mall called Centre One opened in Vashi. The people from mall management team who knew me suggested that I open an outlet in the mall." So Prem Sagar Dosa Plaza joined the big league of restaurants to open a swanky outlet in the mall which attracted a lot of attention. Dosa Plaza gained popularity, got a lot of media coverage as well. Ganapathy started offering franchises to people who wanted to set up the outlet elsewhere. The first franchise outlet opened at Wonder Mall, in Thane. Even today, he supplies the special masala (the ingredients are known only to him) made at his production facility in Vashi. The franchisees are also given trained professionals. Ganapathy went for a brand-building exercise for better visibility. "The brand makeover helped. We got a new logo design as 'approved by Dr. D', and changed the name to Dosa Plaza. This was a big boost to the business. Image: Ganapathy with his colleagues. Dosa Plaza has indeed become a runaway success. Today, we have 35 outlets including franchiees. We plan to make it 100 outlets by 2011," says an optimistic Ganapathy. 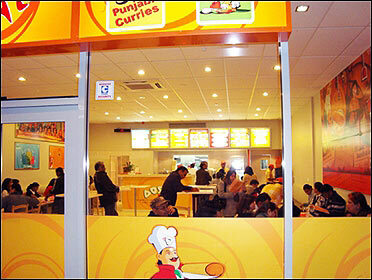 "In 2008, we opened franchisee outlets in New Zealand. About 50 per cent of our clients in New Zealand are locals. In fact, the former Prime Minister of New Zealand, Helen Clark and other ministers had dinner from our outlet," says Ganapathy. The next outlets will be in the US and Dubai. 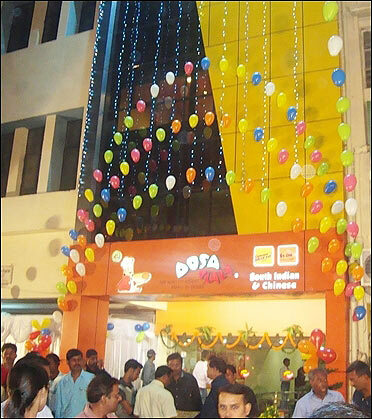 Today, Dosa Plaza has 35 outlets across 10 states in India with a turnover of over Rs 5 crore (Rs 50 million). 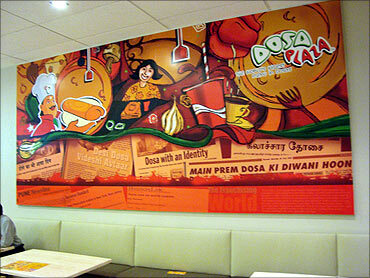 Ganapathy's dream is to make Dosa Plaza a global brand with outlets across the world. The Dosa Plaza success story has also become a case study for management students. 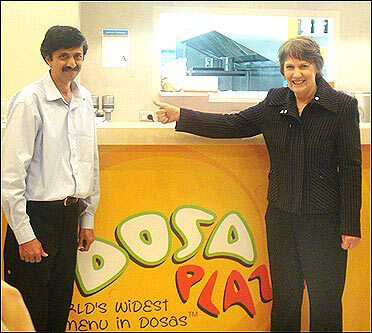 Image: Former New Zealand PM Helen CLark at the outlet. "A PhD student from the SIES college did a project work based on Dosa Plaza. I was invited to the college for an interaction with students," says Ganapathy. For Ganapathy, who has visited almost all the colleges in New Bombay to personally make dosas, it was a humbling experience to talk about his experience as an entrepreneur. Coming to Mumbai was the turning point in his life. "I am indebted to Mumbai. This city has made me what I am. Though initially I faced problems and some kind of discrimination, I feel no other city would give respect to a street vendor like the people in Mumbai. Their love and encouragement have been my strength," says Ganapathy. Even today when his first customers stop to talk to him, he feels extremely happy. They tell him that 'you will go a long way. This is just the beginning.' He feels there is nothing more valuable than their good wishes. Plaza outlet in Mumbai. She liked it so much that he was invited to their house in Chennai. Rajnikant also invited him to attend his daughter's wedding recently. 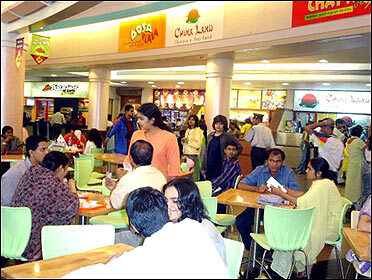 Image: Dosa Plaza outlet inside a mall. His parents were the happiest in the family. "I brought them to Mumbai. I took them to the restaurants. They had food from my outlets and were extremely happy about my success. Now I am very happy that I can give them what they. My father is no more but I am happy that he lived to see my success," says Ganapathy. He continues to live a simple life. "My lifestyle hasn't changed much. The only big difference is that I wear good clothes now. I still prefer to be simple. I do travel by bus and train many times and I enjoy it. I had an Indica car for a long time, now I bought a Ford Fiesta. Earlier, I could enjoy long train journeys, now I travel by flight when I go out of Mumbai," he says. From a carefree life on the streets, now Ganapathy leads a very careful life, cautious about every step he takes. "As the business expands, my responsibilities have increased. Many people are dependent on me. Franchisees are also investing money so I work harder now," he says. People in the village who had ridiculed me, give me a lot of respect. I visit the village once in while, taking part in the temple activities and I also contribute in small way to help people. If someone from my village comes to Mumbai in search of a job, I help them. His biggest recognition came when his story was published in Rashmi Bansal's book 'Connect the Dots' as one of 20 best enterprising individuals without an MBA. "My story has also been mentioned in a Tamil book by Anita Krishnamurthi. Former president Abdul Kalam released this book in New Bombay last year. I felt very privileged to receive a copy of the book from him," he says. Any regrets on not studying? "Well, not at all. But speaking in English becomes difficult when I go abroad. Other than that I don't think I would have learned so much in any school. My experience has been my biggest teacher," he says. Does he ever think about the man who abandoned him? "In a way, I reached here and achieved so much because of him. I wonder where he is now..."
Image: Ganapathy at the US expo. India may be poor, but Indians are rich! Distribution of rupee notes is pro-rich in India! From studying under streetlamps to CEO of US firm! From a candle-seller to a multi-millionaire!